Ahhh yes… our fearless leaders are at it again, this time trying to squash what little value & joy us ‘little people’ experience when shopping on the Internet. I’ve signed two petitions and sent multiple letters to my representatives, but I’m sure it’s to no avail. I believe they call it the “Marketplace Fairness Act.” Yeah, sure… ya betcha. 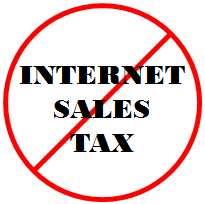 According to Bob Rankin’s article “Internet Sales Tax Is Coming,” total Internet sales in 2012 was only 5% of total US retail sales. So… for this meager 5% we’re allowing states to expand their tax authority & tax across state borders (despite clear legal and judicial precedent arguing otherwise); saddle small Internet businesses with state-infested bureaucratic red tape; discourage tax competition among states; and threaten Internet user privacy because all of our purchase details will now be available to the states/localities in which we live. Such a deal! Should you desire to sign a petition (here & here) or send a letter (here or here) to your representatives, PLEASE DO SO NOW!!! A long piece for the New Republic written by Noam Scheiber details the large number of former Obama team members moving into the private sector, leveraging their administration connections to start lucrative consulting firms. Nearly anything goes without anyone inside the administration blinking an eye — provided certain political lines aren’t crossed. You can read the full New Republic article here.